Egg-laying in Bombylidae is rather special. 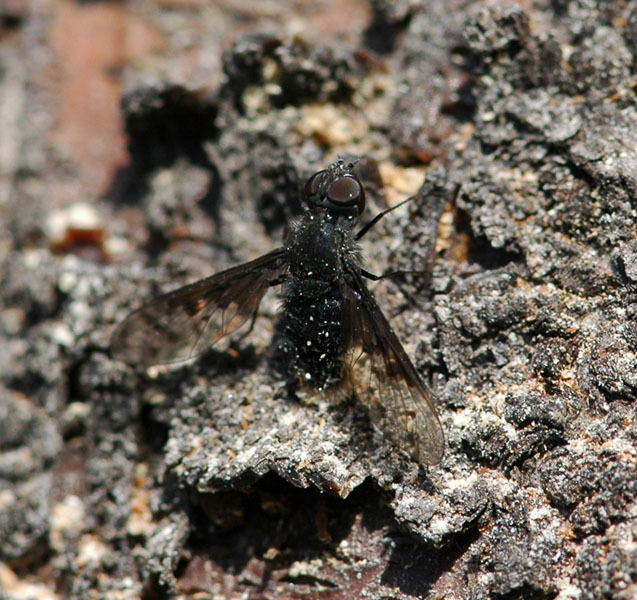 The following account is based on Stubbs & Drake, British Soldierflies and their allies. 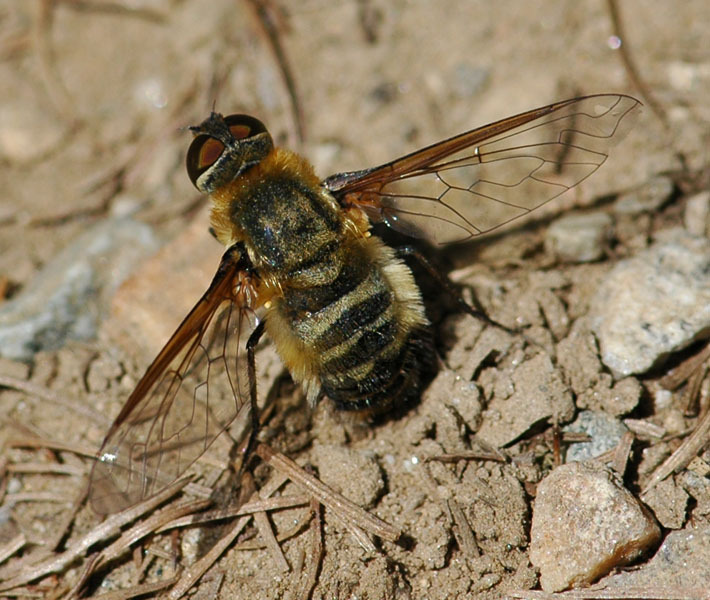 Females of many bee-flies have a special sand chamber in the tip of their abdomen, that can be filled with dust or sand. The eggs are coated with this, and while hovering the female flicks her eggs to the ground. The coating makes the eggs heavier, which might ease the flicking, and also reduces the risk of desiccation (N. Evenhuis, pers. com.). 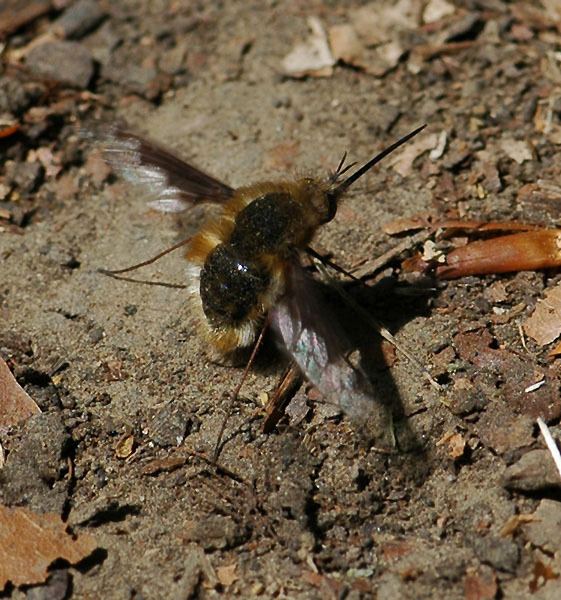 Females of various bee-flies can be seen taking sand into the chamber. This behavior is easily mistaken for oviposition behavior, as I did in case of this female Bombylius major. I observed a couple of females on sunny patches on a small path through a wood in Zuid-Limburg, the Netherlands (near Slenaken). They were touching the ground with their abdomen for quite some time. Their wings were either at rest, or shivering. I observed the same behaviour in a female Villa hottentotta this year in Switzerland, on a fully exposed rough road at ca. 1400 m altitude. Here I want especially to report a female Anthrax species, that was using wood frass instead of dirt or sand. 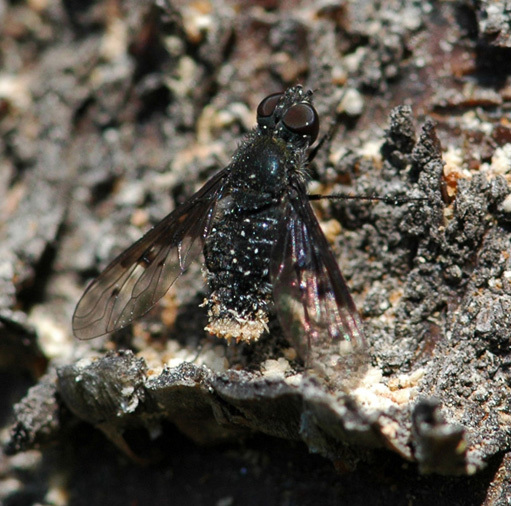 The species has now been identified as Anthrax trifasciatus. 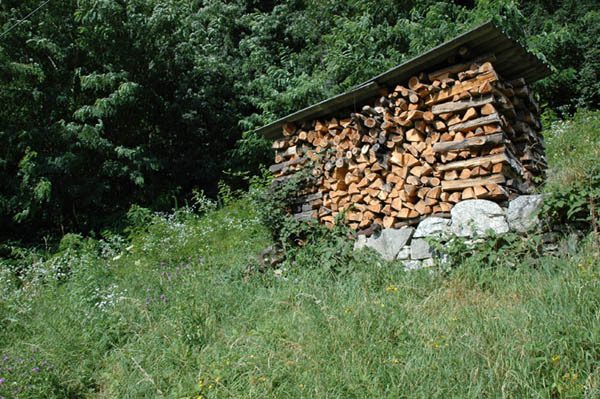 I saw this bee-fly twice at piles of wood meant for burning. It was in the village Mavaglia, in Tessin, Switzerland. Date of observation 19 July 2007. 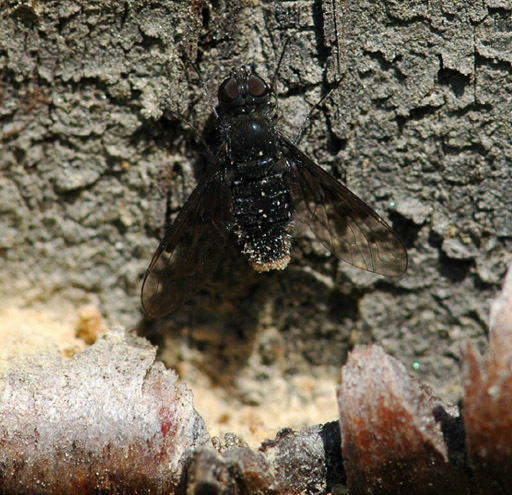 The following photos show the bee-fly dipping her abdomen in saw dust. The behaviour seems very similar to that of Bombylius and Villa - yet with quite different material. Since the frass is very light weight, the idea that it makes eggs heavier so they are more easily flicked seems not very plausible. But dry frass seems not too well suited for preventing desiccation, too! Perhaps the fly does this to prevent the smell of eggs being noticed? 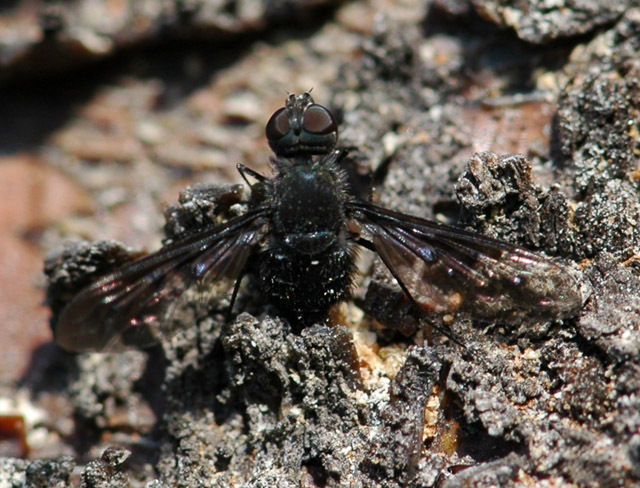 As a result, the tip of the abdomen is coloured whitish, which I first thought to be the fly's natural colouration. Cor Zonneveld you made such beautiful photos! Really it is very common to see this behaviour, at least, here when I spotted them. I will try to verify if the kind of materials are the same. And if I find anything curious I will let know here. I suspect that your Anthrax species is in fact Anthrax trifasciatus. This is fascinating. I love to watch beeflies, so will also be watching for them using different substances now. Hmm, since saw-dust is not exactly a naturally occuring substance, I wonder what the flies normally use. Perhaps dust from wood-boring insects? It would be good for visual & chemical camouflage purposes. The word you need in English is 'frass'. This means both the sawdust produced by insect wood boring activity and the sawdust like excrement of wood consuming insects. I've understood that just one isolated spot in the other part of the wing is typical for trifasciatus; in varius both outer cross-veins have spots. frass is also used as a term in leafminers (Lepidoptera, Hymenoptera, Diptera,...). There frass are the excrements of the larvae that can be seen when the leafmine is hold against the light. The specific place, shape & color of the frass can be important in determination. Kahis has convinced me that the shown Anthrax is indeed trifasciatus.